former is a unique work; and as a fictionalized version of real history, the only thing the latter can be compared to is Art Spiegelman's Maus. Both depict World War II horrors as seen by the author and/or members of his family. but on opposite sides of the world. Maus is about Nazi atrocities visited upon European Jews, and Nakazawa's work is about the destruction of Hiroshima, where he grew up. He was only six years old when the bomb dropped on August 6, 1945, and he survived by the fortuitous circumstance of happening to to be standing by a wall that shielded him from instant death. But seeing the person he was talking with suddenly burn up before his eyes created an impression that cried out to be expressed years later, when he was well on his way to a successful career in comic books. His first major expression about that horrifying experience was a straightforward, factual account titled Ore wa Mita, which appeared in Shonen Jump monthly in 1972. It was published in America by Educomics (Food First Comics) in 1982, under the English translation of the title, I Saw It. In 1973, the weekly Shonen Jump began serializing his Hadashi No Gen ("Barefoot Gen"), a much longer, fictionalized version of the story. The protagonist of the semi-autobiographical work was young Gen Nakaoka, growing up as Nakazawa had, in Hiroshima of the early 1940s. Despite war-time hardship (he placed responsibility on his own country's warmongering leaders as well as on the enemy), the family had good times as well as bad. But the bad times could be harrowing, as when his older brother was pressured into "volunteering" as a kamikaze pilot. The big turning point in the story was, of course, the day everything around him suddenly changed for the worse. 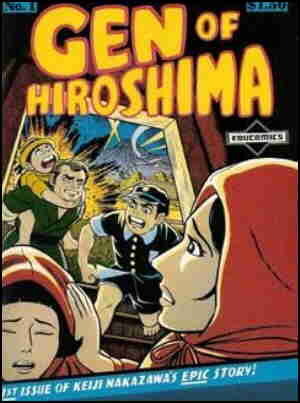 In English, it was published by Educomics as a ten-volume series of graphic novels, titled Gen of Hiroshima. The dropping of the bomb came right at the end of vol. 1. Later volumes were as melodramatic and improbable as the average manga. But they were played against a backdrop of very authentic devastation, and the remaining family members' struggle for survival was anything but lighthearted entertainment. This wasn't about a factoid gleaned from history books. It was about a family's response to a world turned upside-down. A generation after its original publication, Barefoot Gen/Gen of Hiroshima, especially its early chapters, has become a classic of graphic novel literature. Both it and I Saw It will undoubtedly be read and studied for many generations to come. Text ©2008-10 Donald D. Markstein. Art © Keiji Nakazawa.